Advection The word comes from a Latin root meaning to bring or carry. Applied to the fog, advection implies that winds have brought the vapour from elsewhere. Advection fog can form when moist air flows over a colder surface. It is very common in some parts of the world. Indeed, many of the offshore fogs—such as those off Newfoundland and Nova Scotia—result when warm moist air from the continent flows out over a colder ocean. 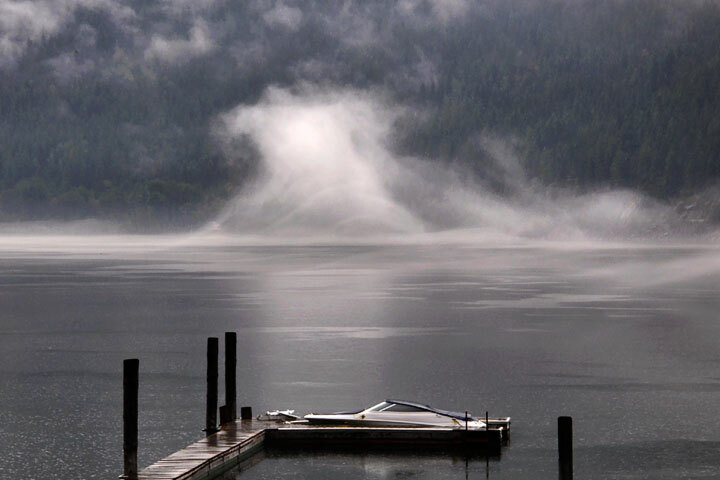 However around here, mountains block the sweeping flow of air at the lake level, so the extensive advection fogs seen elsewhere are not to be expected locally. the ends of the Main Lake in the spring when warm moist air from the land flows over it. Condensation Two very different possible mechanisms are discussed on the page about condensation. As noted to the left, the advection fog is a result of vapour mixing. Yet, most other sources imply that cooling is the cause of the condensation. Certainly when warm moist air flows over the colder surface, vapour is cooled. Yet, such sources ignore the fact that there is not only a downward heat transport (the cooling), but a downward moisture transport (a drying). Consequently, both the vapour pressure and the equilibrium vapour pressure decrease and the humidity does not exceed 100%. In the end, condensation does not result from that cooling (and drying) but from vapour mixing. Wherever advection fog forms, the process is the same. Start with warm most air moving over a colder surface. While the lower portion of the air is cooled by contact with the colder surface, the important thing is that the vapour is cooled. Under some circumstances, cooling will raise the humidity above 100%; in this case it doesn’t as there is also a loss as some vapour condenses on the even colder surface below. So, the cooling, itself, does not produce the fog. Nevertheless, the stage has been set for the formation of a mixing fog. When this cooled vapour mixes with the warmer vapour above it, a mixing fog ensues (see the discussion on condensation for why this can happen). So, what is the difference between the steam fog and the advection fog over the Lake? 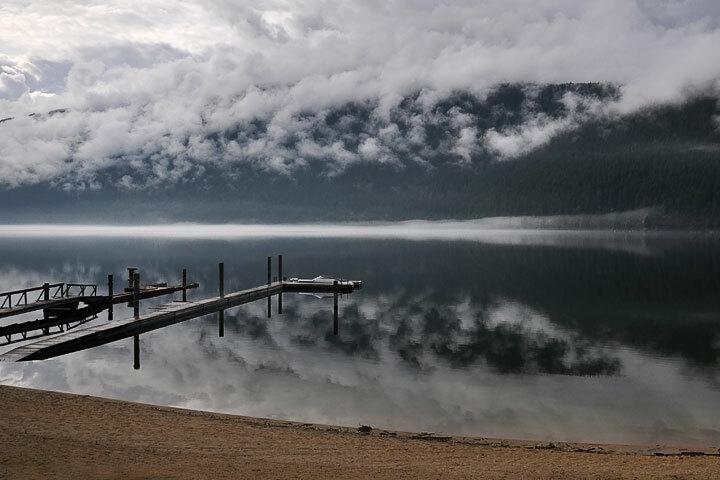 Both are shallow fogs adjacent to the water’s surface, and both result from a mixing of the ambient vapour with vapour modified by contact with the lake surface. But, in the case of the steam fog, it is warm below and cold above (giving rise to the characteristic puffs of convection), while for the advection fog, it is cold below and warm above (giving rise to a much smoother looking fog). The flow of water along the West Arm is not uniform across the width of the Lake. The main flow is confined to a relatively narrow deeper portion. The rest of the Lake is often quite shallow and readily warms in the summer sun. But, along the main channel, there is a greater mixing of surface waters with deeper colder waters (accentuated by flow through various narrows). Consequently, in the summertime, the main channel sometimes gets an advection fog as adjacent warm moist air flows over it. There is steam fog on the mountainsides, but of interest here is the advection fog which lies over the main channel on the far side of the arm. Waders and swimmers are aware that creek water is usually colder than lake water. 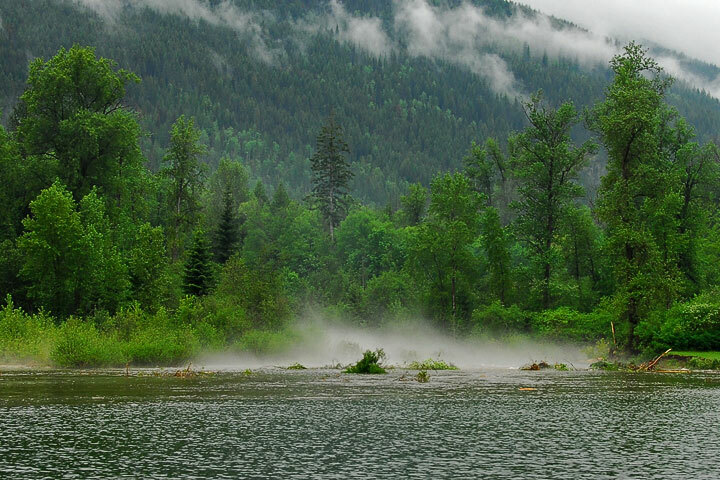 When warmer moist air from the adjacent lake surface flows over the outflow from a creek, an advection fog can result. 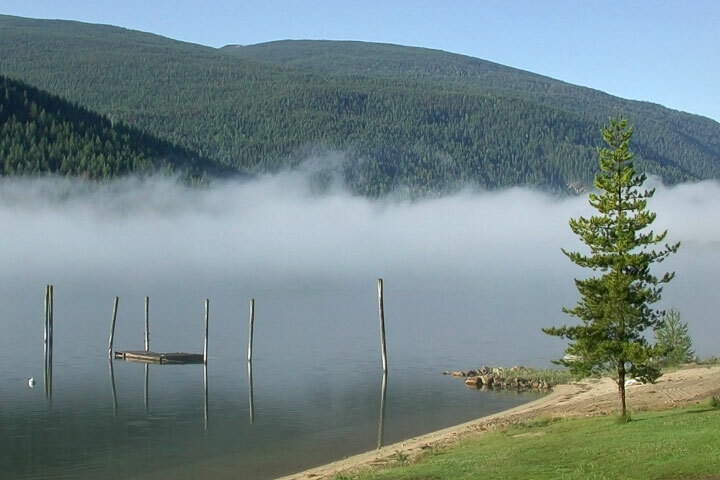 This advection fog is forming at the is the mouth of Laska Creek. A tower of fog is growing on the advection fog over the channel. The cooling of the air as it flows over the cold channel is is evident from the layered appearance of the fog. It is stable: warm air over colder air. Such a configuration—an inversion—easily supports gravity waves and some of them are apparent. One wave seems to have grown particularly large, and so lifted the moist air above the inversion. This produced condensation in the air above the crest of the wave. The difference in the smoothness of the cloud above and below the inversion is easily apparent.